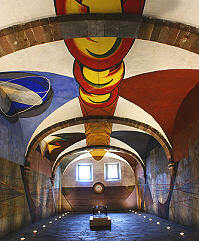 I f studying art is on your San Miguel agenda, head first to "Bellas Artes." That's what everyone calls the nicest of art schools in San Miguel de Allende, probably because few want to spit out the entire official name—El Centro Culturál Ignacio Ramírez "El Nigromante"—Bellas Artes. This place is very special. Only two blocks from the busy Jardín, it's an oasis of peace and quiet is this noisy town. And it is truly beautiful. You can find art schools and cultural centers in towns and cities all over the world. But not all of them are themselves works of art. The building was originally constructed in 1755-65 as the cloister area of the Convent of the Immaculate Conception (Las Monjas) The convent was founded by María Josefa Lina de la Canal y Hervás, daughter of one of the most famous of all great San Miguel families, the Canal Family. Their town home now houses the Banamex, right on the Jardín, and their country estate became the Instituto Allende. Associated with Mexico's Instituto Nacionál de Bellas Artes (INBA), this former place of prayer and contemplation is now a sort of Church of Art. Classes is drawing and painting, ceramic and weaving, photography, printmaking, music and dance, gallery exhibitions, a concert hall, and other arts-related activites go on all year. The cafe Las Musas, tucked under the arches of the cloister arcades, is a lovely place to meet a friend, read a book, enjoy a plate of pasta or a cappuccino and just look out onto the patio garden and enjoy the peace that seems to have permeated the very walls. It's been called the most ambitiously landscaped cloister in all Mexico, lush as a jungle with 20-foot high bamboo plants, towering poinsettias covered with so many red blooms in season you think they'll topple over, orange trees, rubber trees, palms and ferns. The central fountain with its endearing Lamb of God on top, gurgles a counterpoint to the strain of a violin or piano from one of the rehearsal studios. And now imagine the irony of a convent, home to several generations of brides of Christ, today being named for one of Mexico's most famous atheists. 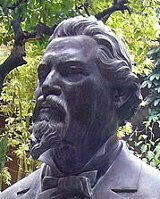 Ignacio Ramírez is one of San Miguel de Allende's most famous native sons. Born here in 1818, when it was still called San Miguel el Grande, he was definitely a man of many parts. As a student, he first bacame famous (or infamous) for a dissertation in which he proclaimed: "God Does Not Exist: The Beings of Nature Maintain Themselves." And with that statement, he became the most famous atheist in Mexico. He took the pen name "El Nigromante" (The Necromancer) as a student, probably because so many of his writings were incendiary. 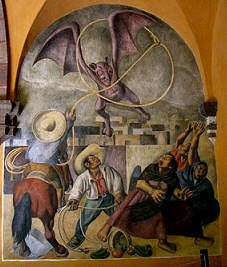 Ramírez was a true Renaissance man, sometimes called the Voltaire of Mexico. He was interested and educated in dozens of areas. He became nationally famous as a lawyer, a politician, an orator, writer and publisher, a political satirist, a civil judge, reformer and member of Congress. Above all, he was a free thinker, which did not always sit well with those in authority. He was exiled by Emperor Maximilian, imprisoned by Santa Anna, and finally spent the last dozen years of his life as a Supreme Court justice. His writings encompassed works on history, politics, economics, botany and physiology, geology, paleontology and chemistry as well as pure literature. Clearly a Man of Parts. In the 1860s, President Benito Juárez ordered all church property except for the actual church interior confiscated and given to the state for secular uses. Overnight, the largest landowner in the country, the Catholic Church, lost its vast holdings. The ex-convent of Las Monjas had many uses in the following years, including being an elementary school and housing cavalry regiments during the Revolution. In 1937, Felipe Cossío del Pomar, a well-known Peruvian artist came to San Miguel and asked the government to allow him to open an art school there. The first director of the school was Stirling Dickinson. Eventually, that school grew into the now-famous Instituto Allende and moved its headquarters to the country estate of the Canal family—a fitting move from Sor Josefa's convent to her ancestral home. 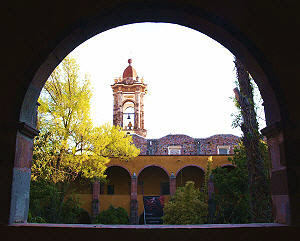 In the 1960s, the lovely convent cloister became Bellas Artes, the San Miguel outpost of the national arts and culture institute. On the ground floor of Bellas Artes you'll find exhibit galleries, the dance studio, the ceramics studio and the Café Las Musas. Also, along the north wall of the cloister, in a space that housed the nuns refectory, is what is probably the most famous work of art in San Miguel de Allende, an unfinished but still powerful mural by Davíd Alfaro Siqueiros. One of the famous triumvirate of noted Mexican muralists—along with Diego Rivera and José Clemente Orozco—Siqueiros was teaching mural painting at the Bellas Artes in 1949, when many of the students were U.S. GIs recently returned from World War II. Apparently the man had a temper. He's rumored to have once thrown a student down the stairs. He was known for frequent temper tantrums, and in an apparent disagreement with the school administrators, he stormed out, leaving the mural unfinished. But even in its unfinished state, the Siqueiros mural is a powerful abstract that makes a strong impression as soon as you walk into the room. The renovations have returned the colors to full power and force and make the room seem much larger than it is. As you climb the stairs, you see more murals, which were painted by early students at the school. There are more studio and rehearsal spaces upstairs, and in the northwest corner is a lovely small auditorium/concert hall. It's used for performances during the Cervantino Festival in October, for film showings during the Expresión en Corto film festival, for literary readings, student concerts and other events. If you're planning to visit San Miguel, do be sure to put Bellas Artes on your list of must-see attractions in San Miguel de Allende. And if you're moving here permanently, count on having it as a major hang-out. El Centro Culturál Ignacio Ramírez "El Nigromante"